If you are on this site, you may know that I have been earning my living with travel writing for the past 5 years. To get to this point, I have read A LOT of advice. And based on my own experience, I believe the most important thing a freelancer should learn to master is how to pitch to magazine editors. Is there a science to it? Well, yes and no. The advice one finds online and in books wildly varies in quality and form, so much that you’d be hard-pressed to think whether or not there actually IS a proven method how to pitch to editors and succeed. Well, among many, I have been following James Durston’s advice for a while because I find it simple, inspiring, and actually useful in understanding the pitching process. For those who don’t know James yet, he used to be the former editor of CNN Go and then CNN Travel. He later started the interesting online resource for travel writers, Travel Write Earn, which I recommend you read and subscribe to. It seems like James really cares about helping freelancers upping their game: he just launched a new platform, Pitchwhiz, which aims at improving the chances we all have to land that assignment and earn money. We reached James in Hong Kong to ask all there is to know about his new project. And without further ado, judge by yourself if it is something you’d like to try. It’s FREE of charge, for now. Hi James, can you please explain why you came up with the Pitchwhiz idea, and in what way it will be a game changer for freelancers and editors? I’ve been a freelance writer and editor for the last 18 years (yep I’m older than I look!) and in both these roles there was always a very basic challenge: finding the right people, at the right time, on the other side of that email divide. As a freelancer it’s always tough to find the right title, and the right editor within that tile, and then the right email address for that editor, to pitch ideas to. As an editor it’s often tough to find high-quality writers in the right place at the right time who are available to work. Pitchwhiz bridges this gap, making it super easy for freelancers to find editors and send them well-structured pitches, and for editors to find writers. I think it’s game-changing because it’s the only system I know of that comes at this challenge with the freelancer front and centre. 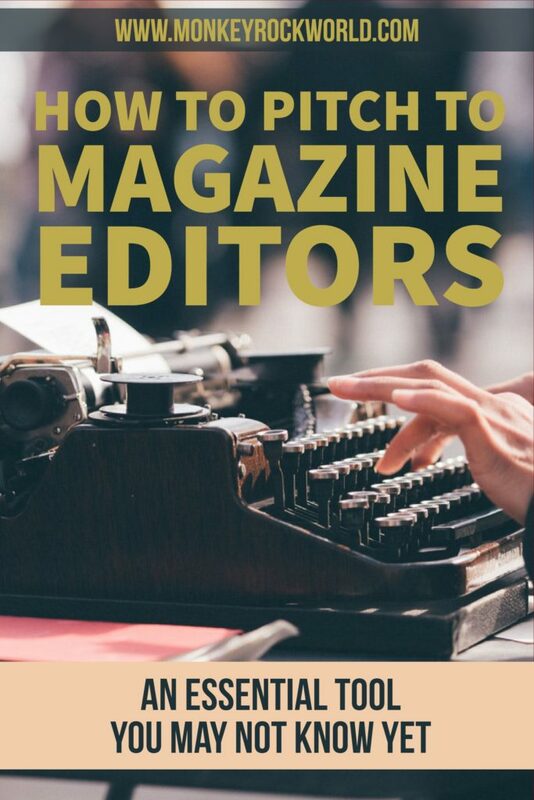 There are a couple of other sites out there that try to connect writers and editors, but they focus on the benefit to the editor. Pitchwhiz has been designed very much from the freelancer’s perspective, trying to make a tough vocation a little simpler and easier. OK James, let’s get really basic: how does Pitchwhiz actually work? 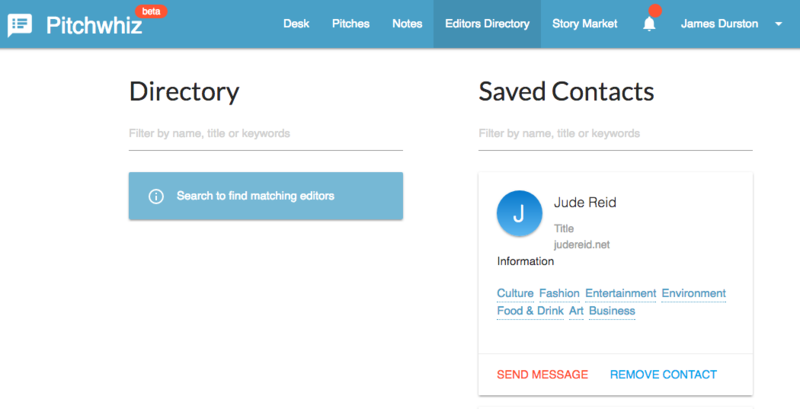 You can think of Pitchwhiz as two databases – one for commissioning editors, one for freelance writers (and editors, sub-editors, photographers, proofreaders… basically any editorial freelancer) connected by a messaging system. It allows writers to search for editors and publications and message them with their story ideas, and allows editors to search for writers who can cover the topics or locations on their beat. There are several other elements, including email tracking (so you can see when an editor has read your pitch for example), and a pitching workflow that helps you turn an idea into a well-structured pitch. There’s a Story Market, where both sides can post in a public forum stories for sale or that they want to buy. And we have plans for adding much more later on – a forum for discussions, invoice/payment tracking etc. So to describe a quick use-case: let’s say you’re a travel writer wandering through Hong Kong. You visit the best tea shop you’ve ever encountered, and jot down a quick note in your journal about amazing tea shops in Asia. Back at your desk, you can turn this into a ‘Note’ in Pitchwhiz. At the click of a button, this Note can be turned into an Idea: “Asia’s cutest tea shops”, for example. You fill in this idea with some more detail, and then at the click of a button, can turn this Idea into Pitch, where you can search for an editor on the Pitchwhiz system, or use an email address you know already. Once sent, you’ll be notified when your message has been opened, and also if you get a response. Messages and their replies go through to both the Pitchwhiz account and the registered email address of the member, and you can reply from either place too. And hopefully you get the assignment and make loads of money! That’s just one case of how you can use Pitchwhiz to quickly turn Ideas into Pitches, and search for editors to contact. As an editor, why do you believe Pitchwhiz will help find better writers and better stories? Because we’re coming at this from the freelancer’s point of view, trying to create something really valuable and useful for freelancers first and foremost, I hope we become the go-to platform for the world’s best freelance writers. If that happens, Pitchwhiz then intrinsically becomes valuable to editors too. The problem for editors is not so much finding writers – throw a stick and you’ll likely hit at least three travel writers before your dog catches up to it in some places – the problem is finding high quality, professional writers who you enjoy working with and want to keep working with again and again. It’s very early days yet, but there’s definitely scope in future for creating a system that encourages, rewards and highlights the best contributors. Pitchwhiz has an in-built contact directory that gives you access to some pretty influential names in the business… I wish I had this a few years ago! In view of the above, and as a former editor of CNN Travel, can you share some “words of wisdom” for all those who, frustrated by the pitching process, still struggle boosting their freelance careers? I think the first thing to note is that you will never sell every story you pitch. I interviewed a successful travel writer and photographer on my blog a while ago; she has credits with CNN, National Geographic, Travel + Leisure, BBC – all the biggest titles in that space, and even she only scores with her pitches about 45% of the time. So it’s a tough gig. Acknowledge that, and work to improve your story ideas and your pitches as much as you can. I think one problem is a lot of writers consider the pitch a bit of a chore that they’d really rather not go through. I go into quite a lot of detail on my blog, directed at travel writers mainly but applicable to all freelancers, about why the pitch is arguably the most important part of your story. Your pitch is what brings in the money. It gets you the sale if it’s good, or it doesn’t if it’s bad. So it’s worth thinking about, and my blog (and a book I wrote) describes how to pitch editors, what they like, what they hate, and how they think about the stories they assign, so writers know what angles to take. I argue that the single most important element of a pitch is a headline, or working title. I’m always astonished at how many pitches come in without this major signpost to what the story is about. Giving your story a good headline – one that fits the publication you’re pitching – shows you know your idea well enough to boil it down to 6–8 words, it helps you as a writer keep to your own brief when writing, and allows the editor to quickly decide if he/she wants to keep reading or not. Even if you don’t win the commission, structuring your pitches well proves you’re an organised soul who should be able to produce a good story, and may be worth considering again next time you pitch. What are the next plans for Pitchwhiz? Right now we just want to build up our members and make sure the core feature of the site – the ability to contact relevant people – is in tact and flourishing. We will likely become a paid system at some point in the future, so sign up now to use it for free while we’re still in beta! And at last, in your opinion, what are the qualities of the “perfect pitch”? Does it even exist? The perfect pitch definitely exists. I even wrote a blog post about it! It’s not complicated at all, and perhaps one of the problems is that writers think they have to include too much in a pitch. A pitch is just a teaser, remember, and the most important parts of a pitch are the broad, high-concept ideas within the story. I’ve received 1000+-word essays before as pitches, for a story that might only run to 800 words, and it’s just a turn off. Be concise, stick to the main concepts and ideas, add detail to show you know your subject, but don’t go overboard. The editor will write back for more detail if they want it. Having said all that, don’t think there’s only one way to pitch. The above is just a go-to failsafe that I recommend, because it’s simple and quick. But here’s a list of other pitches, all of which were successful: you can read them all here. Thanks for this post Marco, and congratulations on a great looking blog. Hope you and your readers find Pitchwhiz useful – I thought it was about time the freelance world got hold of something like this to make what can be a hard job at least a little more efficient! If any of your readers want to ask me about it, feel free to contact me at jd@pitchwhiz.com.